Share amazing moments with your fellow travellers. Spend several nights in Queenstown, New Zealand's adventure capital, where's you'll have tonnes of time to explore. Cruise Milford Sound watching out for he spectacular views..
One-day Tongariro Crossing (optional) and other exciting walks. It is currently shoulder season in New Zealand. 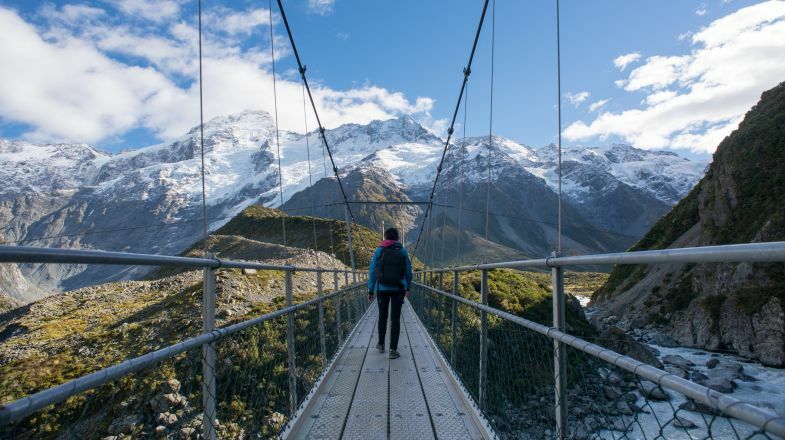 Prices are good, and New Zealand's tour attractions aren’t crowded. See the shimmering Waitomo Glowworm Caves. Set foot on the Lord of the Rings movie set. Enjoy peaceful boat rides and nature walks. Trek through the Catlins, a breathtaking land full of waterfalls, titanic caves, illustrious nature walks and remains of a petrified wood forest..
Visit the well-preserved gold rush town of Arrowtown and sample renowned local drops in Gibbston Valley..
A cruise along Lake Manapouri to Doubtful Sound – the second largest fiord in Fiordland National Park – will leave you speechless. Raw, primeval landscape of Rotorua shaped by volcanic activity. Golden beaches of Abel Tasman. Fox Glacier and the deep fjord complexes around Milford. Tour a network of caves in Waitomo and witness nature's illumination in a section lit up with glow worms. Discover Waitomo's incredible limestone cave system, with night walks to see the glow worms – or better yet, some underground black-water rafting. Watch geysers erupt on traditional Maori lands in Rotorua, and take the Maori experience to the next level with an optional cultural performance and traditional hangi feast. This trip has plenty of spectacular waterfalls, but Huka Falls is one you’ll want to pack the camera for. Discover the breathtaking Bay of Islands. Observe Waitomo's mysterious glow worms. New Zealand is remote, beautiful and spectacular. It gives you a taste of all the beautiful things in life without taking you away from comfort or luxury. It introduces you to stunning natural beauty without taking you away from civilization (mostly). It brings you closer to journeys that let you rediscover yourself as a traveler. There is a reason why movies like The Lord of the Rings, The Hobbit, King Kong, Chronicles of Narnia, Avatar (also shot in China), The Last Samurai and Vertical Limit were shot in New Zealand. The Land of the Long White Cloud always finds a way to inspire you with its beauty and leave you entranced with its culture. New Zealand is an excellent country for road tripping, especially if you want to see all the country has to offer. Keep in mind that the country has remote places where you can drive for hours without spotting a shop or petrol station. Always plan ahead. Sandflies are little black insects with a nasty bite, and they’re extremely common on the coasts year-round. To avoid being bitten, invest in some insect repellent and cover your ankles and head. If you are bitten, your saliva acts as a great temporary itch-relief before you can buy proper cream. While free WiFi can be found in most major cities, it can be quite sporadic otherwise. If travelling to New Zealand's remote south-island, be prepared for slow internet (if you come across any at all). Love the outdoors? Lucky for you, New Zealand law allows people to camp just about anywhere (unless posted otherwise). Consider renting a campervan for an incredible trip across the country. While New Zealanders (also called Kiwis) speak English, they have several unique phrases. “Bush” means forest, while “togs” are swimsuits and the local “dairy” is the corner store.